My big brother is getting married in March. He and Vanessa are having a sweet, backyard wedding that will feature charming aspects from each of their personalities. 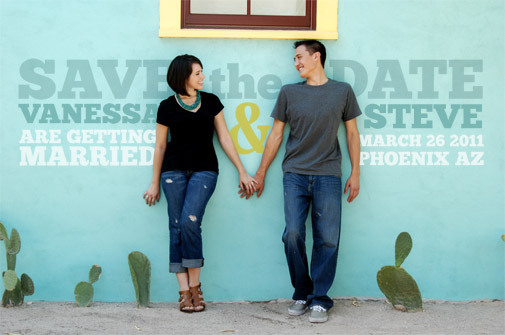 They recently took a trip to Tucson, where they both went to college, to have engagement photos taken. The photos are absolutely beautiful, taken by their friend Andrew Westover. My contribution to this event, so far, is their save the dates. They want to keep the vibe fun and simple, and I think everyone will be looking forward to sharing their special day with them. This entry was posted in design, family, weddings and tagged save the dates, wedding invitations. Bookmark the permalink.